Reference number for this case: 17-dec-54-Bersaillin. Thank you for including this reference number in any correspondence with me regarding this case. In 1966, the French ufologist Jacques Vallée published in the British Flying Saucer Review, in his UFO landings catalog, that on December 17, 1954, at 5 p.m., between Bersaillin and Colonne, in France, a cabinetmaker of Poligny saw a very bright object on the road. He first thought it was an American car with his headlights on, but he soon realized that the light came from a dark craft about 80 meters away. The light became brighter, the witness felt an intense heat wave, and thought he was going to die, but eventually the light went away. 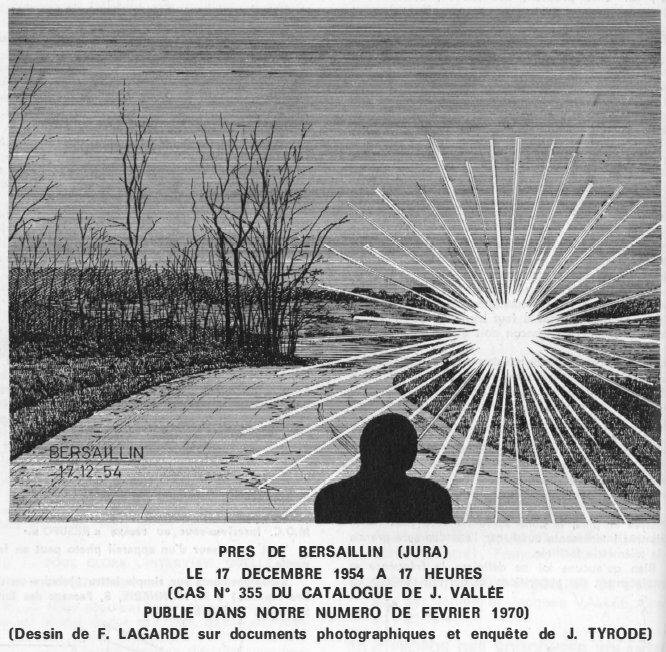 The case was republished in many ufological publications, without any other information, but with an allusion to an investigation by Jean Tyrode on the location - whose report I could not find: only a sketch by Fernand Lagarde (below) that appeared in the Lumières Dans La Nuit magazine in June 1970, said to have been made according to photo of the location, is available to me. In addition, it was not until Jean Sider in 1997 that we learn that the source would be an article on page 2 of the local Dijon newspaper Les Dernières Dépêches for December 20, 1954, an article that I have not found yet. Jean Sider further indicates that the witness was one Mr. Charles Monnayeur, and that he was on a motorcycle. The least ordinary explanation would be that this witness would have seen a foreign car. The thing indeed does not seem to have left the ground, and according to the sketch and the report, it would have remained all the time in the ground. The sensation of heat should then be considered to have been a somatization under the effect of a great fear. At that time, French cars had yellow headlights, according to the rules, whereas foreign cars usually had white headlights. The witness no doubt found that as the headlights, or the light, were white, logically, it must have been an American car. This is not a well-assured explanation, because according to Jean Sider quoting the press, the thing was neither on the road nor just "80 meters away" as written by Vallée, but 80 meters from the road, i.e. off the road. Sider also mentions that the light was one white light, not two headlights. 197. Dec. 17. A woodcraftsman who saw a very bright light on the road between Bersaillin and Colonne (France) first thought it was an American car with its headlights on, but soon observed it was produced by a dark object about eighty metres away: the light became brighter, the witness felt an intense heat wave and thought he was going to die. But the lights at last went away. Dec. 17, 1954, 05:00 P.M., Bersaillin (France). A woodsman from Poligny saw a very bright light on the road, first thought it was an American car with its headlights on, but soon observed it came from a dark craft about 80 m away. The light turned brighter; the witness felt an intense heat wave and thought he was going to die. Finally, the light went away. (Personal). Note: When Vallée indicates that the source is "Personal", it just means that he has some source at hand, id does not mean that he "personally" investigated! Jacques Vallée indicates that on December 17, 1954, a logger, who saw a very brilliant light on the road between Bersaillin and Colonne, France, initially believed that it was an American car with all lit headlights, but he noticed soon that it was produced by a dark object at approximately 80 meters from there. The light became more brilliant, the witness felt a heatwave and thought that he was going to die, but the light finally moved away. A cabinetmaker from Poligny saw a very bright object on the road, thought at first that it was an American car with its headlights lit, but soon noticed that it came from a dark machine about 80 meters away: the light became more brilliant, the witness felt an intense heat wave, and thought he was dying. Finally, the light went away (Personal). This ufologist mentions the case of Bersaillin, and other information, as part of an "alignment" of five cases in an arc of circle and on the river Orain. This ufologist mentions the case of Bersaillin, with no other information, as part of an "alignment" of cases. The magazine indicates that there was an observation in 1954 in Bersaillin, case 355 of Jacques Vallée, which was investigated again by Jean Tyrode. That day, around 5 pm, a Poligny cabinetmaker discovered a shiny object on the road 80 meters away. Suddenly, the light emitted became brighter and the witness felt a heat wave so intense that he thought he was dying. Finally, the light source moved away. (Valley Catalog No. 355). If a heat source, capable of being suffocating at 80 m, had actually been there, it should have burned out its immediate surroundings. But it was not so. We can therefore reasonably infer that the witness of Poligny was the victim of a false thermal sensation. It is even possible to wonder if he was not also dealing with a "paraluminous" radiation. This testimony is not an isolated fact and there are many similar cases that can sometimes manifest themselves in extremely curious forms but perfectly explainable according to the basic logic that we have chosen. The two ufologists and authors indicate that on December 17, 1954 at 05:00 p.m. on the road between Bersaillin and Colonne, a cabinetmaker of Poligny saw a very brilliant ball on the road. He initially thought that what he was looking at was only an American car with its headlights on, but he soon noticed soon that it was caused by a dark apparatus at approximately 80 meters of him. The light became more shining, the witness felt an intense heat and thought that he was going to die, but the light moved away. The authors indicate case 355 of Jacques Vallée's catalogue as source. -7- Catalogue Vallée - cas N° 355 . (Ce catalogue se trouve dans l'ouvrage Chronique des apparitions Extra-terrestres des éditions Denoel - l'édition "j'ai lu" est incomplète). A stretch of road near Bersaillin was brilliantly lit, causing a French woodsman to think some sort of big American auto was approaching. Instead he saw that the source of the light was a dark mass about 70 yards away. The light became more intense and the increase in brightness was accompanied by a wave of heat. The light dimmed shortly thereafter. 155. 155. Rogerson, Peter. "INTCAT Part 11", MUFOB. New Series 7. Summer 1966 #41. p.7. Jean Sider indicates that on December 17, 1954, at 05:00 p.m., in Bersaillin/Colonne, Poligny, the Jura, France, Charles Monnayeur drove by motobike when he is suddenly dazzled by a white headlight which he thinks to be from a foreign car, which obliges him to stop. It is actually a mass black carrying this light, located at 80 meters of the road. The light of the headlight intensifies and Mr. Monnayeur feels heated on all the body, more and more. He feels "finished". Then the light disappears gradually and the motorcyclist taked advantage of that to drive away as fast as possible. The author indicates that this comes from the local source "Les Dernières Dépêches" of Dijon, for December 20, 1954, page 2. The Belgian ufologist indicates that in 1954, on December 17, in France, in Bersaillin, at 17:00 a cabinetmaker (a logger dixit Charles Bown [no, a logger dixit Vallée in Bowen]) of Poligny saw an object very shining on the road: it was a dark apparatus at approximately 80 m from him; the light became more brilliant, the witness felt an intense heatwave and believed he was dying. Finally the light moved away. Geneviève van Overmeire indicates that the source is Jacques Vallée: "Chronique des apparitions ET", Denoël 1972 - Coll. J'Ai Lu, p. 293. 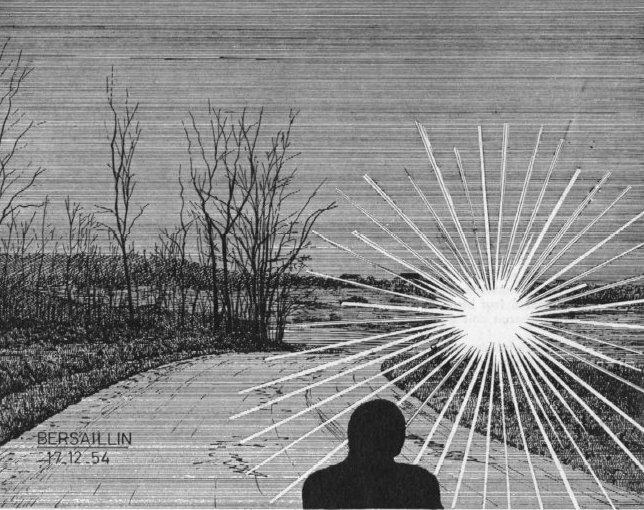 1954 – At 5:00 p.m. on a country road in Bersaillin, France in Jura department, a woodsman sighted a very bright light on the road, coming from a dark craft some 80 meters away. When the light became brighter the man felt an intense wave of heat and he thought that he would die. After a short while the light moved away. (Source: Jacques Vallee, Passport to Magonia, A Century of Landings, case 355). 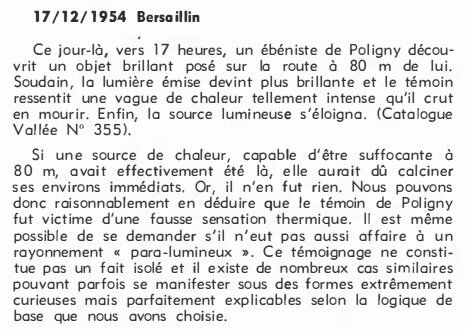 December 17, 17 H: In Bersaillin (France), 1 cabinetmaker of Poligny sees 1 object very shining on the road, thinks initially that it is an American car with its lit headlights, but realizes soon that it comes from a dark apparatus to approximately 80 m from there, the light became more brilliant, the witness feels an intense heatwave, and believed to die. At last, the light moves away. Luc Chastan indicates that in the Jura in Bersaillin on December 17, 1954 at 17:00 hours, the witness drove between Bersaillin and Colonne when he observed a strong light in front of him. He then thought that they were the headlights of an American car. But soon he noticed that it was a dark apparatus at approximately 80 meters which produced the latter. The light became more brilliant, and the witness then felt a heatwave, he thought he was going to die. The light moved away. 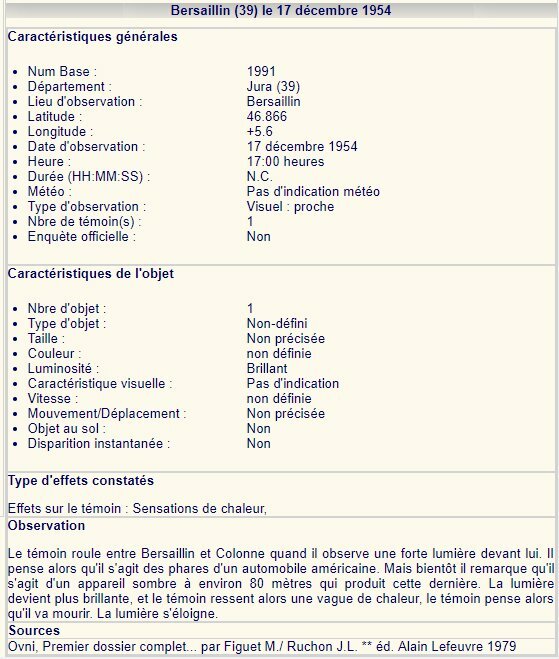 The website indicates that on 17 December 1954 at 17:00 in Bersaillin, France, "A dark craft about 80 meters away with a very bright light" and "At 5:00 p.m. on a country road in Bersaillin, France in Jura department, a woodsman sighted a very bright light on the road, coming from a dark craft some 80 meters away. When the light became brighter the man felt an intense wave of heat and he thought that he would die. After a short while the light moved away." And: "A woodsman from Poligny saw a very bright light on the road, first thought it was an American car with its headlights on, but soon observed it came from a dark craft about 80 meters away. The light turned brighter; the witness felt an intense heat wave and thought he was going to die. Finally, the light went away. An object was observed. Physiological effects were noted. Traces found. One dark object was observed by one experienced male witness on a road." The sources are indicated as Bowen, Charles, The Humanoids: FSR Special Edition No. 1, FSR, London, 1966; Vallee, Jacques, Computerized Catalog (N = 3073); Vallee, Jacques, A Century of Landings (N = 923), (in JVallee04), Chicago, 1969; Schoenherr, Luis, Computerized Catalog (N = 3173); Hatch, Larry, *U* computer database, Author, Redwood City, 2002. *Dec. 17, 1954 – At 5:00 p.m. on a country road in Bersaillin, France in Jura department, a woodsman sighted a very bright light on the road, coming from a dark craft some 80 meters away. When the light became brighter the man felt an intense wave of heat and he thought that he would die. After a short while the light moved away. (Source: Jacques Vallee, Passport to Magonia, A Century of Landings, case 355). A carpenter from Poligny, Charles Monnayeur was driving his motorcycle when he encountered a white light that he first thought came from the headlights of a foreign car, but then saw came from a black mass 80m away. As the light grew brighter, Charles felt an intense heat and thought he was going to die. The light then gradually disappeared. Note: The source reference "Gross 1954" is my file. Not looked for yet. Probably car's headlight. Thanks to the good care of Jean Sider, one understands that the reason the witness thought of headlights of a foreign car is quite simply because the light was white whereas French cars headlights at that time had headlights of yellow color. [---] Article in the regional newspaper Les Dernières Dépêches, Dijon, France, page 2, December 20, 1954. [jv7] "The Pattern Behind the UFO landings", article by Jacques Vallée, in the ufology magazine Flying Saucer Review (FSR), U-K., Special Issue #1, page 20, 1966. [---] "INTCAT Part II", catalogue by Peter Rogerson, MUFOB, U-K., New Series 7, #41, page 7, Summer 1966. [jv3] "Un Siècle d'Atterrissages (suite)", catalogue by Jacques Vallée, in the ufology magazine Lumières Dans La Nuit (LDLN), France, #104, page 5. February 1970. [ld1] Ufology magazine Lumières Dans La Nuit (LDLN), France, #106, last page, June 1970. [jv1] "Chronique des Apparitions Extra-terrestres", French translation of "Passport to Magonia", book by Jacques Vallée, J'Ai Lu - Denoël publisher, France, page 293, 1972. [ld2] Ufology magazine Lumières dans La Nuit (LDLN), France, #125, page 9, May 1972. [jt1] "Les enquêtes", article by Jean Tyrode, in the ufology magazine Lumières Dans La Nuit (LDLN), France, #125, page 9, May 1973. [fl1] "Vers une autre recherche", article by Fernand Lagarde, in the ufology magazine Lumières Dans La Nuit (LDLN), France, #128, page 5, October 1973. [jv2] Summary by Jacques Vallée in "En Quête des Humanoïdes", book by Charles Bowen, French translation of "The Humanoids", J'ai Lu publisher, France, pp 70-71, 1974. [ga1] "Cinq plus un... ou la boucle bouclée", article by the ufology group G.A.B.R.I.E.L., in the bimonthly ufology magazine Ouranos, France, nouvelle série #9, page 6, 4the quarter 1976. [pr1] "INTCAT Part 11", catalogue compiled by Peter Rogerson, in the ufology magazine MUFOB, U-K., New Series #6, page 7, Spring 1977. [fr1] "OVNI, Premier Dossier Complet des Rencontres Rapprochées en France", book by Michel Figuet and Jean Louis Ruchon, Alain Lefeuvre publisher, France, page 73, 1979. [cc1] "Ephémérides des années d'espoir de l'ufologie (6 - Suite et fin)", article by Gilbert Cornu and Henri Chaloupek, in the ufology magazine Lumières Dans La Nuit (LDLN), France, #257-28, page 28, November / December 1985. [mf1] "Catalogue Francat des rencontres rapprochées en France (Listing 800 - 1982) (2 - Suite)", compiled by Michel Figuet, in the ufology magazine Lumières Dans La Nuit (LDLN), France, page 21, #257-258, November / December 1985. [lg1] "The Fifth Horseman of the Apocalypse - UFOs: A History - 1954 November - December", monography by Loren Gross, USA, pages 60,65, 1991. [js1] "Le Dossier 1954 et l'Imposture Rationaliste", book by Jean Sider, Ramuel publisher, France, page 272, 1997. [---] "Computerized Catalog" compiled by Luis Schoenherr. [dj1] "Encounters with Aliens on this Day - December 17", web page compiled by Donald A. Johnson, Ph.D., compiled from the UFOCAT 2003 computer database, USA, at www.ufocat.com. [jb1] "Novembre-Décembre 1954", web page by Jérôme Beau, website RR0, France, 2003, at www.rr0.org/1954-11.html. 0.1 Patrick Gross April 19, 2003 First published. 0.2 Patrick Gross March 1, 2006 Additions [jb1], [dj1]. 1.0 Patrick Gross December 26, 2008 Conversion from HTML to XHTML Strict. First formal version. Additions [jv2], [go1], [js1], [ld1], [lc1]. 1.1 Patrick Gross February 288, 2010 Addition [ud1]. 1.2 Patrick Gross October 19, 2014 Addition [ni1]. 1.3 Patrick Gross November 2, 2016 Addition [ub1]. 1.4 Patrick Gross November 22, 2016 Addition [lg1]. 1.5 Patrick Gross January 21, 2017 Addition [jv7]. 1.4 Patrick Gross November 23, 2018 Additions [jv3], [ld1], [jt1], [fl1], [pr1], [ga1], [cc1], [lg1], [lh1], [pr2]. This page was last updated on November 23, 2018.